Cora Millet-Robinet (1798–1890) published her two-volume epic of household management, cookery, gardening and agriculture for the French country housewife, Maison rustique des dames, in 1845. Over the next eighty years, it went through a score of editions. Rather as our own Mrs Beeton, it was a book to be found in every household, a first resource in the kitchen, the garden and the drawing-room. Despite its title, it seems to have been as popular among the urban middle classes as with their peers living in the country. The French Country Housewife is a translation into English of the first volume of the fourth edition (1859). It includes the sections dealing with furnishing and decorating, managing the family and the household, entertaining guests, and cookery in all its guises, from bottling and preserving fruit and vegetables, making jam, and salting meat to the staples of the best-loved style of French cooking, la cuisine bourgeoise. 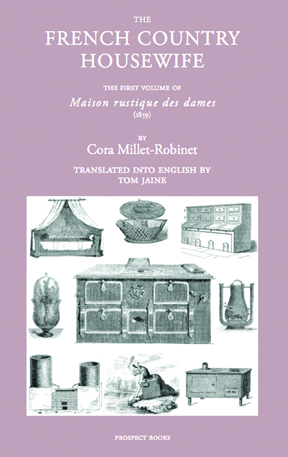 Madame Millet-Robinet’s book is a treasure trove of information for lovers of history, for readers of novels from the heroic age of French literature – Hugo, Balzac and Flaubert, for enthusiasts for French cookery and for all those people with houses deep in the French countryside wanting to know more about their surroundings. Tom Jaine started out as an archivist, and then began a career in food: first in restaurants and then as a writer and publisher. He edited the Good Food Guide from 1989 to 1994, edited the latest editions of the Oxford Companion to Food, How to Build a Wood-Fired Oven in 1996, and Making Bread at Home in 1998. He won the Glenfiddich Trophy as food writer in 2000, and the Derek Cooper Lifetime Achievement Award from the BBC Radio 4 Food Programme in 2014. Since 2000 he has edited the magazine Petits Propos Culinaires. From 1993 to 2014, he ran Prospect Books. The two-volume Maison rustique des dames (1844–5), the first volume of which has now been heroically translated into English by Tom Jaine, was for many decades the domestic bible of the French bourgeoise. Through consecutive editions (Jaine works from the 1859 version), the book helped to break new ground by targeting women as opposed to professional chefs, chateau stewards or their gourmand masters. It was, above all, aimed at those who resided in, or planned to move to, the countryside; although originally a townie herself, Millet-Robinet wished to promote the rural idyll, the joy of country living and the role of women in agri­culture, horticulture and domestic economy. The compendium was compiled at a time when educationalists believed that all knowledge could be systematically accessed through the pages of a book, and, in contrast to today’s kitchen where we mourn the loss of oral recipes, in mid-nineteenth-century France Millet-Robinet was part of a wave of writers firmly of the belief that women, as Jaine explains, “need no longer depend on word-of-mouth instruction that probably enshrined the ignorance and prejudice of older generations”. Agricultural reforms and land ownership changes were transforming the French countryside after decades of war and revolution; technological advances were equally rapid; feminism was astir; and the formidable Millet-Robinet was poised to become the Marianne of la France profonde. Surprisingly, Millet-Robinet is now relatively unknown even in her native land, so Jaine’s meticulously researched introduction is a huge help in placing her in context. His excellent translation keeps a sense of period without feeling dated and is enhanced by the erudite footnotes to be expected given his distinguished record as a food writer, historian, editor and publisher. He quotes Elizabeth David’s remark that Millet-Robinet “may well have had some influence on our own Mrs Beeton”, and indeed both nineteenth-century writers saw no separation between the management of a good kitchen and a good household. The Frenchwoman went further, offering encyclopedic advice on everything from childcare to interior design, chimney-sweeping to reading matter and musical tastes, and keeping poultry to keeping staff. Jaine, however, is keen to point out other differences. While Mrs Beeton addressed a largely urban readership, Mme Millet-Robinet spoke to (would-be) country folk. The former gathered her recipes like nuts in May from many sources, albeit fleshing them out with further detail, but Millet-Robinet’s work is clearly rooted in personal experience. Practicality was ever foremost in her mind, says Jaine, “durability, with grace, her watchword. Mud and dirt were ever-present foes”.